Fabulous Five Go For Lancashire Gold! 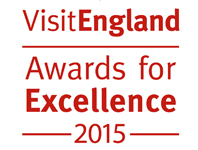 Marketing Lancashire is delighted to announce that five Lancashire Tourism Award Winners 2014/15 have been named as finalists in the prestigious Visit England Awards for Excellence 2015. The glittering Awards Ceremony is being held on Monday 11 May 2015 at the Sage Gateshead. The VisitEngland Awards attracted a total of 345 applications and the Lancashire finalists will have to wait until the Awards Ceremony to find out which award they will receive. All finalists are guaranteed to receive either a Gold, Silver, Bronze or Highly Commended Award. In 2014, Lancashire’s national winners included: The Parkers Arms, Silver in the Taste of England category; Sancastle Waterpark, Silver in Access For All category; Bleasdale Cottages, Silver in Sustainable Tourism category; Visit Garstang Centre, Highly Commended in Visitor Information Provider category; Visit Blackpool/Blackpool Resort Pass, Highly Commended in Tourism EXperience category.